Before we can understand why fluoride is important, we must first discuss the processes of demineralization, remineralization, and how they affect tooth enamel. Enamel is made up of closely packed mineral crystals. As oral bacteria consume sugars and carbohydrates, they release acids which dissolve these crystals that make up enamel. This process is known as demineralization. Luckily, this negative effect is countered by the process of remineralization. Here, the minerals in saliva, including fluoride, are deposited back into teeth and prevent decay. The reason that all dentists recommend fluoridated toothpaste for oral care is because it’s active properties protect and strengthen teeth, which is particularly important at a young age. Your child’s permanent teeth are still developing, so by consuming enough fluoride, their mouths are properly equipped to perform the remineralization process. Furthermore, fluoride ingested from water or foods is absorbed through the bloodstream and becomes part of developing teeth until the age of 16. When it comes to protecting teeth, fluoride’s benefit is two-fold. 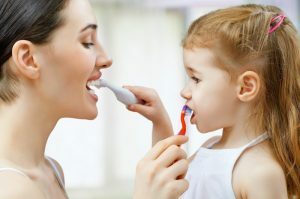 But this process can only occur if your child gets enough from routine oral care and a balanced diet. It’s understandable that parents want to protect their children’s mouth, but aren’t sure how to do so. Keep in mind that as soon as teeth appear, which is around 6 months of age, decay can develop. Prior to their teeth erupting, you’ll need to clean their mouth with a moist washcloth or gauze pad. For children younger than three years of age, use no more than a smear of toothpaste the size of a grain of rice when brushing. Be sure to purchase a child-sized brush that fits their mouths. You should also begin flossing for them as soon as two teeth touch. Once they get between three and six years of age, start using a pea-sized amount of toothpaste. As recommended by the ADA, brush their teeth twice a day for at least two minutes at a time. 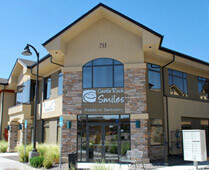 While fluoride is found in most public water systems, your child can also benefit from topical fluoride treatments provided by your pediatric dentist in Castle Rock. This varnish is slowly absorbed into teeth over a few hours and works to maintain and strengthen enamel. If your child prefers a gel version, they can use that as well. Regardless of the one they choose, eating and drinking can resume immediately after treatment. Children are at very high risk of tooth decay, but fluoride can protect them for life. Schedule an appointment today to confirm your child’s oral health status! 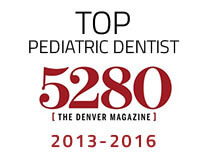 Dr. Layne Benzley earned his DDS degree from the University of Iowa and his pediatric dental specialty certificate from the Eastman Dental Center at the University of Rochester. He’s also acquired everything needed to be certified as a Diplomate of the American Board of Pediatric Dentistry. To learn more about his practice, contact him through his website.